2 hours guided tour with coach. This tour offers an initial overview of the history and structure of the city. It takes you through the charming streets of Bergen, focusing on the downtown area surrounding the bustling harbour,the UNESCO-listed Wharf, the beautiful city park and adjoining museums. As well as all of the main attractions in the city, this tour offers entrance to one of the city’s excellent museums, Troldhaugen, the home of the composer Edvard Grieg. Facts about the life of this great son of Bergen as well as a visit to his house and the lovely surroundings are a must. Time for a stop at the museum/souvenir shop/café is included. Bergen is rich in culture and the fine arts, ranging from giants such as Picasso and Munch to exciting local artists with their own ateliers. This tour includes The City Art Collections, Stenersen's Collection and Rasmus Meyer's Collection. There’s time to visit the glassblower at Verftet and browse amongst local craftsmen’s work. 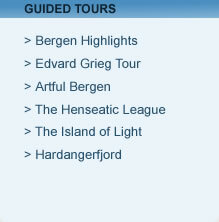 Your knowledgeable guide accompanies you amongst Bergen’s treasures. For over 400 years, The Wharf – one of Bergen’s main attractions – was one of the offices of the Hanseatic League. We stroll through the wooden tenements and delve into bygone days and the history of the Wharf and the stories of those who lived and worked there. This walk can also include a visit either to the St. Mary’s Church, Bryggen’s Museum of medieval archaeology or the Hanseatic Museum. Join this journey through history while we walk at the Unesco listed Wharf. This tour combines the Highlights of Bergen with an excursion to Lysøen (The Island of Light) and the amazing villa where Ole Bull, the famous violinist and composer, spent the last summers of his incredible life. Your guided journey highlights the famous landmarks and acquaints you with the uniqueness of Bergen whilst bringing you to the neighbouring municipality of Os. A short boat trip will transport you to this peaceful island. Book your private guide and driver. A short ferry-ride takes you across the Bjørnefjord to the Hardanger Fjord area known for its steep mountains, its small hillside farms and its orchards. Folgefonna Glacier, waterfalls, a sheer ravines and a breathtaking mountainous landscape are some of the ingredients of this beautiful landscape tour.Ample time is allowed for stops at cultural institutions of your choice and photo opportunities. Book your private guide and limousine or van with driver. Rates from NOK 3300 pr person. The success of Bergen author Gunnar Staalesen's novels about Varg Veum, Bergens very own private investigator, is the inspiration behind these city walks in Bergen. Join a tour with drama, stories and history through the most charming parts of central Bergen. 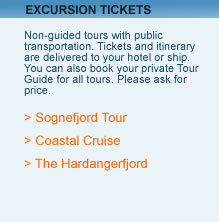 This tour may be booked for groups in Norwegian, English, or German. Duration 2 hours walking tour. For booking of your private guide and van/car with driver, please enquire about rates. Ticket Delivery Service: We provide tickets, a detailed itinerary with timetables, and tour description. When booking this tour, please let us know where you will be staying in Bergen, enabling us to deliver tickets to reception at your hotel or ship. The Tour: This tour takes you through some of the most magnificent scenery in Norway.An 8.40 am start begins with a train ride from Bergen to Myrdal, bringing you to the famous Flåm Railway, which is just one of the highlights of this tour. Lunch may be enjoyed in Flam where you also have access to the Flam railway Museum. After lunch, a relaxing boat trip will bring you to Gudvangen, which lies nestled in the breathtaking Nærøyfjorden. This fjord is part of the great Sognefjorden, and is listed on UNESCO's World Heritage List. Your journey continues from Gudvangen by local coach to Voss, with a short stop to enjoy the atmosphere of this winter ski-resort. The last leg of the trip is aboard the direct train to central Bergen. Transportation is by express boat from Bergen to Stord. Hire of guide for this tour is possible. Rates available on request. Ticket Delivery Service: We provide tickets, a detailed itinerary with timetables, and tour description. When booking this tour, let us know your accomodation so that tickets may be delivered to your hotel or ship. The Tour: Norway is famous for its extensive coast and this tour allows for sea-level permits close –up views of one of the most beautiful coastal areas in Norway. Travel is aboard a fast and comfortable catamaran to Stord, an island south of Bergen. Change boat to return to Bergen. Passing the Hardanger fjord and spectacular coastal scenery, old trade centers, and small villages, and upon returning, you will surely enjoy entering scenic Bergen harbour. This trip starts at 09.50 from Strandkaiterminal in Bergen, located close to the Fish market. A boat change at noon takes you to Stord. Return trip to Bergen leaves Stord at approx 12.00. Arrive Bergen approx 14.00. The price is for the complete roundtrip ticket without guide. You travel with public transportation. You can book your own guide and private transportation. Pleas ask us for rates.